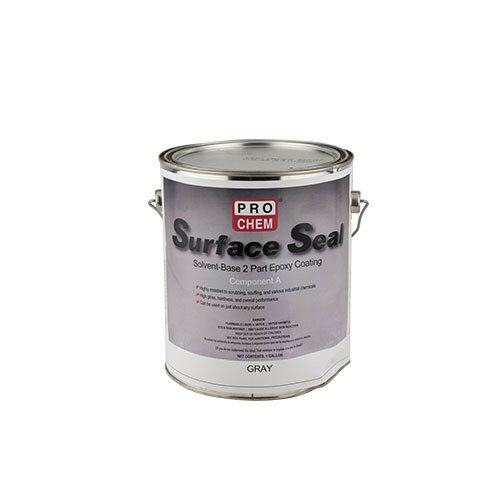 Surface Seal | Pro Chem, Inc. SURFACE SEAL is a premium, 2-component, catalyzed, polyamide, epoxy coating with exceptionally high gloss, hardness and overall performance. Designed to protect and beautify interior and exterior masonry, metal and fiberglass, the application possibilities are endless. It produces a heavy-duty, high-gloss film that is highly resistant to scrubbing, scuffing and various industrial chemicals, including strong acids. Not only does it provide an excellent visual appearance, it is outstanding for use where wearing, abrasion, algae and mildew are a problem. This high-solids formulation is easy to apply and maintain making it ideal for residential, commercial and institutional applications. Can be applied to previously painted surfaces. Follow surface preparation instructions to ensure the floor is prepared to accept coating. Clean and dry all surfaces and clear all dust, dirt and debris. Glossy surfaces should be lightly scuff sanded and cleaned to ensure proper adhesion. For previously painted floors: If the previous coating is sound, clean using a cleaner/degreaser, then rinse well. Allow to dry completely before painting. Mix and apply when rain is not expected for 3-5 days, temperature is 50-90°F, and relative humidity is less than 85%. Pour all of Part B into pigmented Part A and mix thoroughly with a drill-mounted mixing blade. Pot life after mixing is 8 hours. Do not use beyond this time frame. Apply without thinning by brush, roller or spray at 400-500 sq ft per gallon. Work the coating into pores to produce a continuous film. For best results, two coats are suggested for all applications and a minimum of 2 coats are required on bare masonry to fill all voids. This product dries for recoating in 12-18 hours. Allow the paint to cure for at least 7 days before use. Package: This is a 1-to-1 mixture packaged in 2 – 1 gallon cans per kit.